I don’t want to debate the Real Men issue here, but I do love quiche and similar dishes so when Cindy offered to make a couple for supper, Bev and I immediately responded YES. Since she is rarely here, she usually just eats what we cook for supper (except red meat) but a job was cancelled and she was off for the week and had time to plan, shop for, and cook a meal. She pretty well spent the whole afternoon in the kitchen, but at mealtime I understood why. She began by making her own crust for the 9" round and 10”x13” oblong dishes. The oblong one was a meat quiche containing ground beef, breakfast sausage, onions, mushrooms, green pepper, eggs, cheese, cream, fresh parsley, S&P. 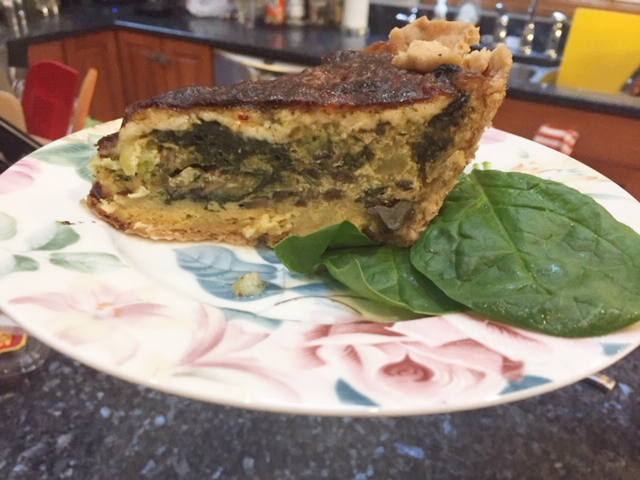 The round one was a veggie quiche containing, fried eggplant, steamed broccoli, sauteed spinach, mushrooms, and green onions, eggs, cream, cheese, fresh parsley S&P. The veggie ready for the oven and the finished meat lovers. This is my piece of the meat lovers – I sided it later with a little piece of the veggie. And Cindy’s piece of the veggie. They were both outstanding and we sure appreciated the fine meal she prepared and now I look forward to her next kitchen venture. My dearly beloved enjoyed quiche; I don't know what that author was thinking all those decades ago. One of our favorite quiches is cheeseburger quiche, which, as the name implies, involves ground beef, cheese, mustard, relish and diced tomatoes. Oh, and more cheese. But I'd happily take the ones Cindy made for you! Those quiches sound DELICIOUS.... How nice of Cindy doing that for you all.... YUM.... I want one!!!! Yum! I love quiche and think both look and sound incredible. Both look delicious! Quiche is a meal that I don't think about making that often either. Quiche is fantastic and these sound delicious, esp the one with meat. I seldom make it but must try to now. Lucky you guys with it being made for you, what a great treat!